James L. Gould is an ethologist, evolutionary biologist, and popular science writer. He has served as a professor of ecology and evolutionary biology at Princeton University since receiving his Ph.D in 1975. He is primarily known for the experiment he designed while an undergraduate at Caltech which proved that bees use complex dances to communicate the location of food. Gould went on to do work that specialized in communication in Southern Right Whales.In addition to several technical works and textbooks, he has cowritten with his wife Carol Grant Gould the popular science book The Honey Bee, and Nature's Compass: The Mystery of Animal Navigation. Gould has published studies that made serious contributions to the ethological understanding of animal navigation and sexual selection. During his long lasting career at Princeton, besides research, Gould has been dedicated to teaching introductory biology and animal behavior courses, as well as field courses in marine biology. (Biography adapted from http://en.wikipedia.org/wiki/James_L.... accessed 2013-12-15). 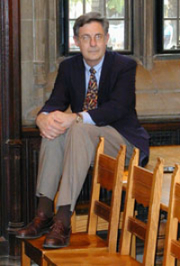 James L. Gould is currently considered a "single author." If one or more works are by a distinct, homonymous authors, go ahead and split the author. James L. Gould is composed of 1 name.